And you too may have asked yourself where the hell are the women in film? Well, here, for a start. Film undoubtedly serves as a mirror for the society we live in. It is no surprise then, that cinema often reflects a narrow view of women. And with underrepresentation of women evident throughout the media in our society, it is no surprise that women are often absent from the film making industry. It is for these reasons that the London Feminist Film Festival was set up this year. And for these reasons, it was a refreshing and exciting event for those lucky enough to catch a screening. I went in to see ‘Herstories’, a collection of ‘shorts’ – mostly documentaries – addressing important women’s rights issues and starring brilliant female protagonists. The first offering is Taxi Sister, produced by Theresa Traore Dahlberg and about a group of women in Dakar, Senegal, who have recently benefitted from a government programme enabling them to become – the first – female taxi drivers. However there were 15,000 male taxi drivers in Dakar, and a mere 15 women. The Taxi Sisters faced objections from the other taxi drivers as well as from the general public. The film focuses on Boury, a lively and powerful character and these qualities help her to confront the objections she faces. Men insist that it is not safe for women to drive taxis; a fellow taxi driver tells Boury this is because her customers might want to sleep with her. Men physically drive into her taxi cab in anger – and she turns to the camera to tell us that she gives as good as she gets. Her determination is relentless and she dreams of becoming the first woman in Dakar to own her own taxi company. However, after the film, we find that the government has put an end to the programme that enabled her to become even a taxi driver. Second comes ‘As a Warrior’, a work of fiction featuring both surreal and very realistic imagery, by Nadia Benedicto. The film begins with Laura lying on a lilo in a pool and dreaming of fearlessly riding a horse through the desert. Back in the real world (Argentina) she is a maid for a rich couple and their daughter Isabelle, and she spends her days in a black and white pinny, answering ‘yes miss’ to her wealthy employers. Then a man arrives to the house late at night, screaming at the gates and refusing to leave without the maid – and it is at this point we realise that she is in an abusive relationship. A security guard instructs the man to leave several times, but Laura tells him to open the gates and goes home with him. The issue is covered cleverly by Benedicto: no abuse is seen but it is nevertheless evident; in the next scene, the woman is back at work, visibly injured and shaken and emotionally unable to continue with the day’s work. It is then we return to the powerful images of our main character riding a beautiful horse, wearing chainmail and a fearless look upon her face. The woman on the horse is the powerful woman our protaganist dreams of being, if only she had the courage to leave her relationship. But then Laura finds that courage and we see her going in to a police station. She has now become the warrior she dreamed she could be – and it is on this positive note that the film ends. The third film is Seating Code, by director Hong Yane Wang,which delves into a strange Chinese tradition. Women are forbidden from sitting on camera boxes in China – in effect meaning that women are shut out of the film industry. This two-minute film shows men and women giving their explanations and opinions on this rule. From young, to old, they are all aware of the tradition, but explanations vary. One woman explains that Jackie Chan started it all by believing that women sitting on camera boxes would bring bad luck to a film. ‘It’s not clean,’ said one man. Another man: ‘Women have periods – they say a bloody disaster may happen’. It is – almost – laughable. ‘It doesn’t look proper for a woman to sit on a camera box, men are working hard, women are not working’. A girl says ‘If girls sit on something phallic it will go limp,the focus could go soft’. According to one man ‘you cannot just abandon a tradition in China’ and according to another: ‘Why would you?’ and ‘It’s not unfair, we’re already more civilised’. Director Hong Yane Wang explains that in China, as a direct result of this tradition, there is only one female camera woman. She adds that nobody asks why this tradition continues, and the film brilliantly highlights the stupidity of such patriarchal traditions. You can watch Seating Code in full here. Quite the opposite story emerges in the next film, where the camera has been used to empower. “The camera is like a weapon for us,” explains a woman in Sari Stories, a film documenting pioneering female film reporters in Andhra Pradesh, in South East India. Much like in our first film, the women have been empowered by the local government; in India it was through the charity ‘Video Volunteers’. With the help and training of Video Volunteers, Indira, Vinodha, Latha and Parvati produce a monthly video magazine. They have also used their cameras to document a subject close to their hearts: child marriage. The film is a collection of three types of film: the Indian women’s own footage, personal testaments filmed by the women themselves, and the film shot by producer Sue Sudbury, usually of the women filming. The women share their personal experiences of child marriage. All but one of them are still married. Latha tells us that women in India are often married after their first period – as young as 12. This is particularly common because men pay a cheaper price for younger girls. Latha herself was sold for $3000. The authorities often turn a blind eye to child marriage. Tradition clearly plays a part. One of the film makers says ‘the differences God created between men and women still exist’. The film work, though, has given these women increased confidence and the courage to continue with their often hard lives. The camera is certainly a tool for these woman, the camera changing the dynamic of the husband-wife relationship. The women ask their husbands questions they feel suddenly able to ask, when ‘hiding’ behind the camera. Although men in Indian society are reluctant to give their wives independence, in such poor communities they cannot argue with the economics. Working in the fields the women would earn around 40 cents, but film making can earn them up to 5 dollars per day. The complexities and dangers of their married lives are shocking. One woman says ‘Sometimes I think of divorcing my husband but he would only re-marry and then another woman would suffer’. However, the film shows the positive impact of breaking traditional gender roles in rural India. Vinodha says this video training has changed her life. Unfortunately, like the scheme in our first film, the project helping these women has now ended – a sad note to end the screening on. You can watch Sari Stories through Al Jazeera here. All in all, the screening is refreshing in its portrayal of women, and in its showcasing of female talent. 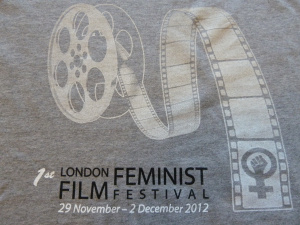 Other fims shown in the festival included a ‘feminist classic’ A Question of Silence, and ‘Fighting Back!’ – a selection of films on sexism and violence against women, as well as other – modern, as well as older – films. All the screenings were followed by lively discussions with directors and commentators. The film festival intends to run next year, too. I highly recommend you go along!